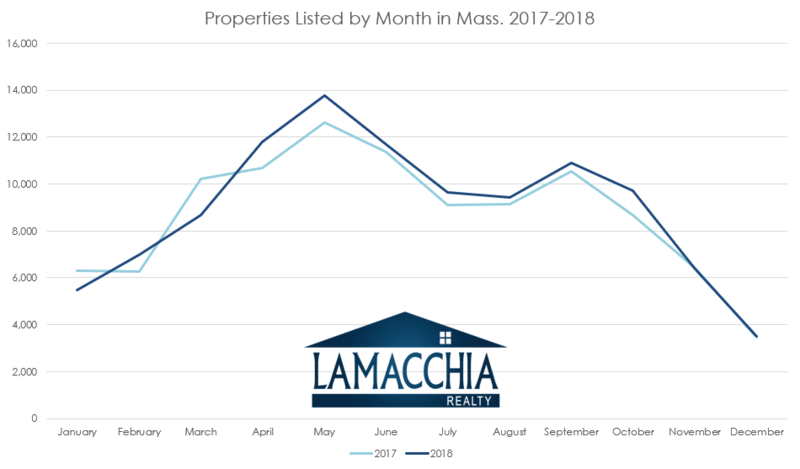 Given the summer and fall market slowdown we experienced in 2018, we are lucky to see a decrease in homes sold by only a single percentage point. 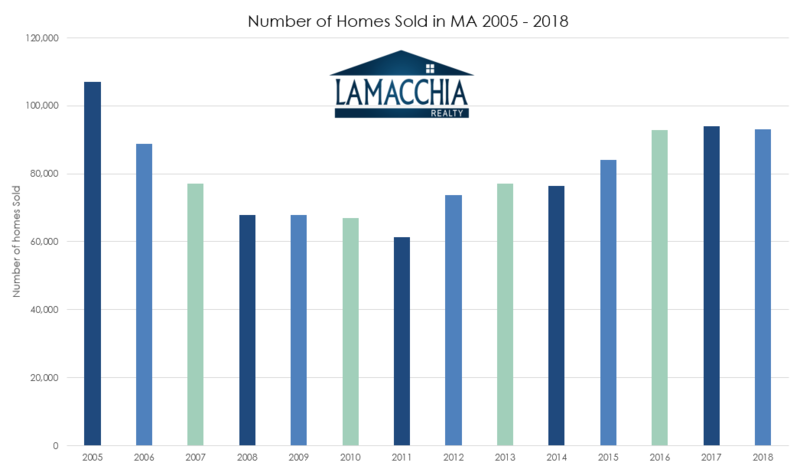 There was a total of 92,956 homes (including single families, condos, and multi-families) sold in Massachusetts in 2018, a .99% decrease over 2017. Single families and condos decreased over 2017 by 1.54% and 1.36% respectively. Multi-families increased in 2018 over 2017 by 4.2%. Below is a graph that illustrates home sales per year since 2005. 2018 underperformed over 2017 in 6 out of 12 months. We saw significant increases year over year in April and July, but for the rest of the year 2018 was either neck and neck with 2017 or couldn’t quite keep up. Home prices in 2018 are up 5.2% over last year, with prices increasing in all three categories. Single families and condos each increased over 2017 by 4.98% and 4.63% respectively, and multi-families increased by 6.07%. As you can see in the graphic below, 2018 prices increased significantly over 2017 every month of the year. 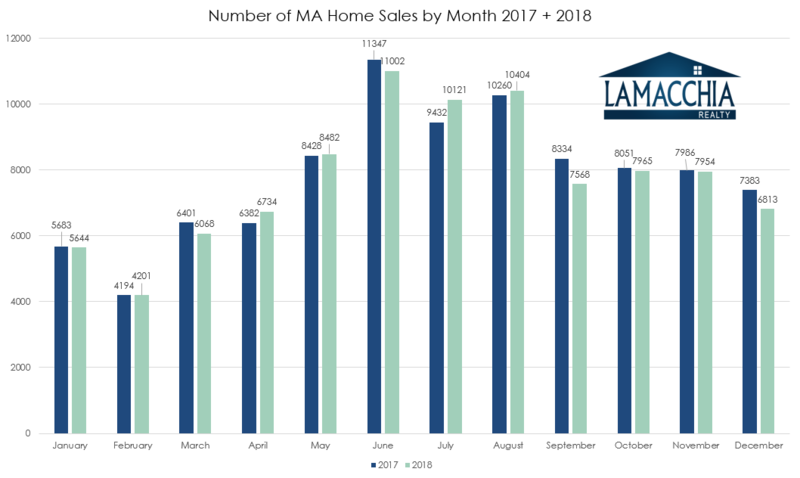 The majority of Massachusetts counties had another strong year of home growth! 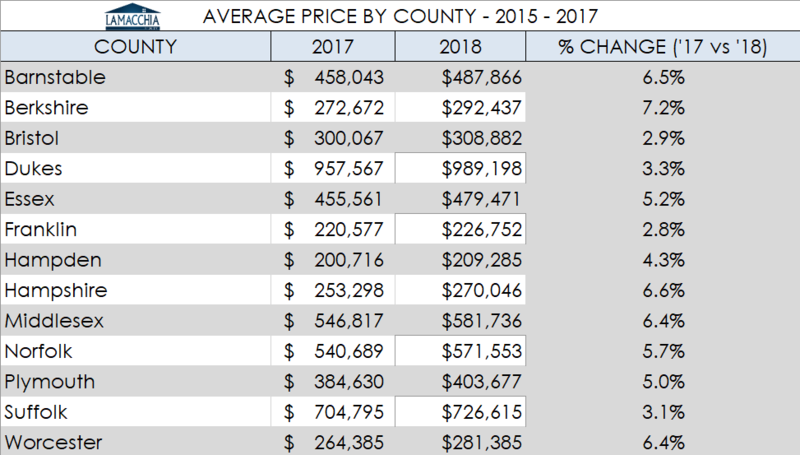 Every county experienced an increase in prices this year over 2017 with Franklin County increasing by the least, 2.8% and Berkshire County increasing by the highest amount of 7.2%. Since about 2012, each start to the year had lower inventory than the year before. 2015 began with the lowest inventory levels in 11 years, 2016 it started even lower, and 2017 began with the lowest inventory ever recorded with a 20% drop from 2016, see the graph below. 2018 started off in line with this pattern but then took a turn in the summer when inventory started to peak and then blow past 2017 in early August. Anthony discussed this in his Op-Ed, 3 Reasons the Real Estate Market has Finally Changed and further explained this shift in his market update video from November. 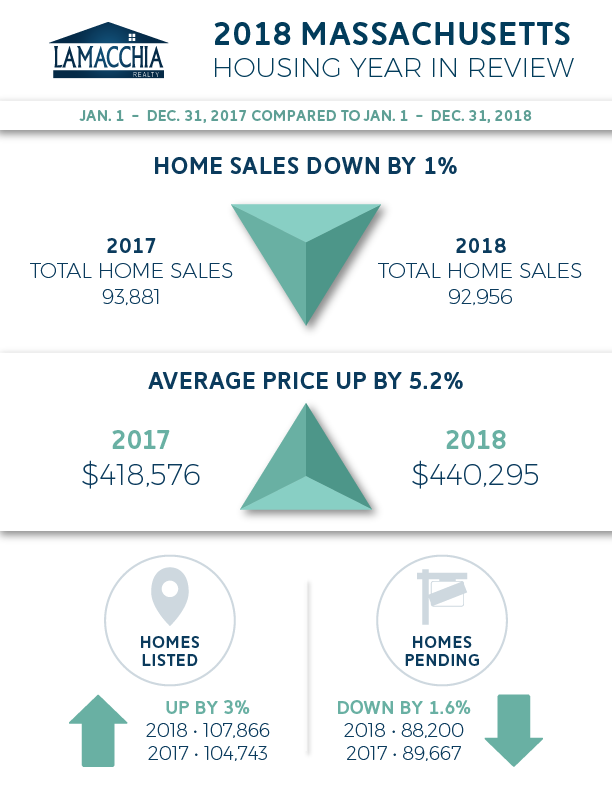 2018 started off with fewer homes listed than the beginning of 2017 but then exhibited more homes listed for the rest of the year as you can see in the graph below. Sellers knew that sale prices were rising and wanted to take advantage, which influenced a strong flux of new listings. 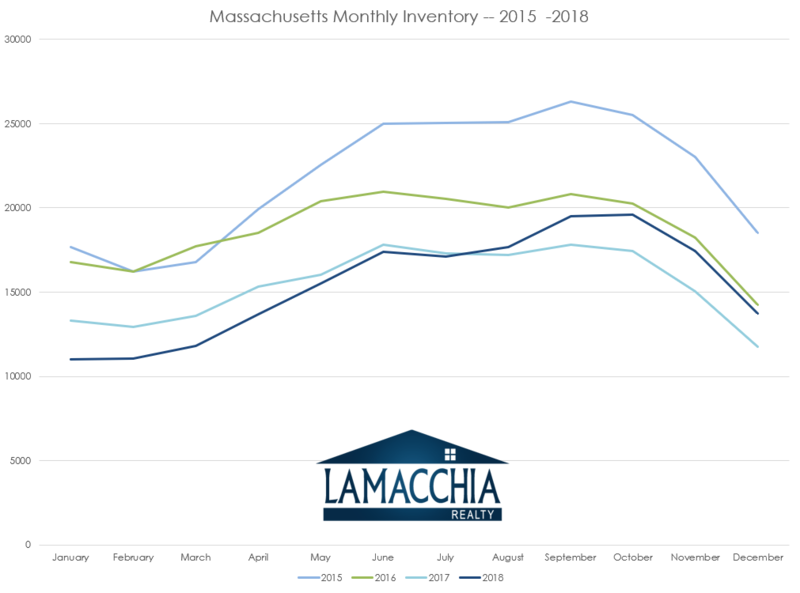 After three straight years of lower inventory and a strong seller’s market sellers really began to over push the envelope on pricing in the summer of 2018 and many buyers finally had enough of it. 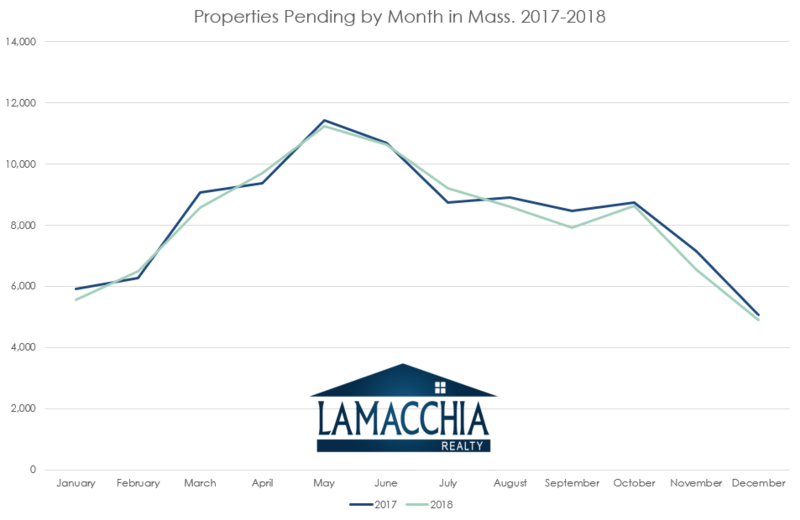 2018 pending sales were lower 10 out of the 12 months. Home prices were prohibitive for buyers as they steadily increased all year, and have since with interest rates increasing as they did, buyers became a bit trigger shy. Fortunately, rates did decrease from the highs we saw giving buyers more room to afford the homes they wanted so that pendings could at least try to keep up with 2017. In last year’s 2017 Year in Review, Anthony’s prediction that we’d see prices steadily increase and sales would be down slightly came to fruition. The issue of supply and demand drove prices up and sales down, but what wasn’t even considered at that point was the interest rates. Though a rise in rates is a sign of a good economy, it’s not great for buyers wanting to upgrade or sellers who wanted to take advantage of rising prices. Sellers who priced too high saw homes sit on the market longer than they wanted and we had to remind buyers that just because a home has sat on the market for longer than 30 days that nothing was necessarily wrong with it. 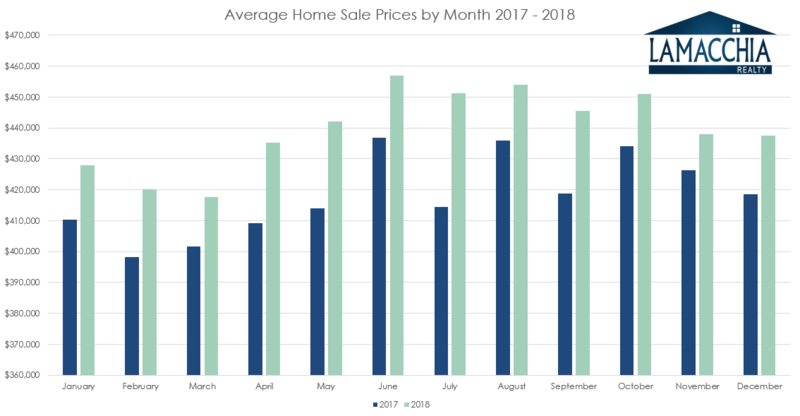 We will likely see a similar pattern in 2019 as we did in 2018, with prices steadily rising and sales struggling to keep up. A lot depends on how aggressively a seller prices their home and how rates will affect buyers. Home sale contingencies will likely continue to be a more frequent factor in home sales.